The security forces found two pilots. One, who was injured in the crash, was arrested. The other appeared at the doorway of the plane and “ignored orders to surrender and was shot after making a threatening gesture,” said Dawn N. Dearden, a D.E.A. spokeswoman. . . . “The pilot who resisted arrest died of his injuries,” she said. “Two D.E.A. agents were involved in the shooting.” . . . Honduran authorities had briefly described a version of the events to reporters last week, saying that one of the two pilots had died. But they did not disclose that the pilot had been shot by American agents. There are several points worth keeping in mind related to this latest killing. 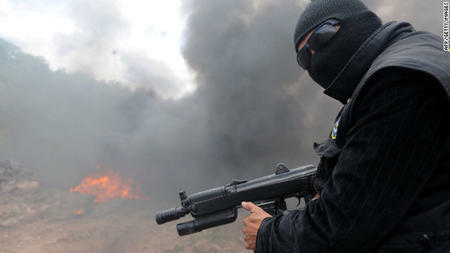 First, as the Times notes, this is the second incident within a month in which the DEA has admitted killing someone on Honduran soil—a previous episode in Honduras on June 23 involved a U.S. agent shooting a smuggling suspect caught in a raid. When the suspect in that prior bust reached for his firearm, a DEA agent “shot him before he could fire,” according to the U.S. embassy’s account. Because [DEA agents] are considered law enforcement agents, not soldiers, their presence on another country’s soil may raise fewer sensitivities about sovereignty. The American military personnel deployed in Honduras, for example, are barred from responding with force even if Honduran or D.E.A. agents are in danger. But if their Honduran counterparts come under fire, [DEA Foreign-deployed Advisory Support] teams may shoot back. For similar reasons, the helicopters are part of a State Department counternarcotics program—and not military. The July 3 raid seems to indicate a lower bar for U.S. agents to use lethal force than that previously reported by the Times. The executed pilot had not shot a firearm or even attempted to shoot a firearm after surviving the crash, according to the DEA—he “ignored orders to surrender” and made “a threatening gesture.” What may have become a far more lenient threshold for U.S. agents’ authority to summarily dispatch foreign citizens was unmentioned in the Times’s account. Third, this event highlights the lack of transparency and accessibility inherent to such military-style actions. The official DEA account of the provocation that led to the killing will likely be the only description available to the public. However, there is good reason to treat U.S. officials’ portrayals of such raids with a degree of suspicion: only weeks ago, they told reporters that boat passengers killed in Ahuas, Honduras, on May 11 “were probably participating in the intense trafficking of illegal drugs that is known to take place” in the region. The Times effectively debunked this claim after speaking with the survivors of the U.S.-organized raid that killed two pregnant women and a 14-year-old boy, but failed to mention in its July 8 article that officials’ previous renderings of U.S. operations in Honduras have been misleading. Finally, this transition toward the U.S. prerogative to take the lives of Latin Americans—even abroad, and far from any official battlefield—is a reflection of the effects of the U.S.-backed 2009 coup d’etat and the subsequent illegitimate regime of military ally Porfirio Lobo. While the Times has consistently refrained from providing the political context in which U.S. military escalation has progressed in Honduras, the question remains: Is there any doubt that a democratically elected leader who did not receive tens of millions of dollars in U.S. military aid would prohibit the United States from gunning down suspects on Honduran soil? It's interesting how the charter cities concept unmasks the libertarian dream as deeply undemocratic. The compatibility of [Augusto] Pinochet and Milton Friedman offered plenty of hints, but this Honduran experiment looks like conclusive proof. First you need a coup. And then you need to set up a zone of freedom - but a special kind of freedom. Not the freedom of association, or of individual expression and development, but the freedom of manoeuvre for an economic elite to do as it pleases under a special kind of state protection. Both the Alternet and Al Jazeera pieces, along with a recent Associated Press article on the current state of peasant struggles in the Aguán Valley, are worth reading.